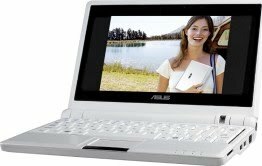 The ASUS Eee is a fantastic ultra-portable notebook with almost everything required for geeks (and nothing that isn’t). Plus it features fantastic build quality and is very well priced. If you live in New Zealand you can get them from DSE; at the time of writing they are the exclusive supplier. I worked out it’s the same cost as importing one once you include all the duties and tax, plus you get the advantage of a proper NZ-style mains charger. Anyway, being so small I thought it would be nice to be able to carry this around in the car. Unfortunately I couldn’t find a car charger available anywhere at the time so I decided to tackle the problem myself. As a bonus this provides an opportunity for an external high-capacity battery. I thought at this stage it would be worth noting that a commercial car charger is now available for less than it cost me to build this from Expansys and is available in most countries (select your location on their site). It outputs 9.5v from 10-18v in at up to 2.5A. I’d actually recommend it over the design here is it seems to perform better at lower voltages (that one works down to 10V). However I have kept this page up as a reference for those who enjoy tinkering. The charger included with the Eee is rated at 9.5v, 2.315A. There isn’t a fixed voltage regulator available for this exact voltage, so the circuit needed to be designed around an adjustable regulator. 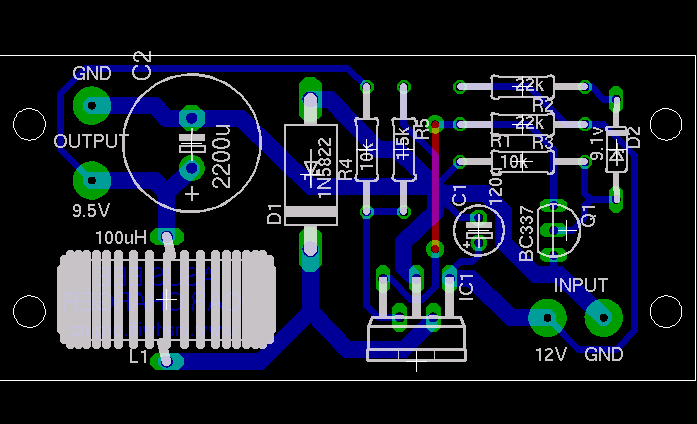 I decided to design the charger around the LM2576 “Simple Switcher” IC from National Semiconductor. There are tons of ICs like this available, many of which are a bit more efficient, however I selected this one because it is readily available and relatively cheap. It also has a lower drop-out voltage (~2V) than many other chips I looked at which is important when powering the device from a car or 12v SLA battery. This circuit could have used a standard three pin regulator IC such as the LM317, however most types require an external transistor when handling so much current and not to mention the fact that they are very inefficient; they draw the same amount of current from the input as the load and the difference in power is dissipated as heat. The main problem with using the LM2576 is the fact it needs quite a large inductor due to its somewhat low switching frequency. The inductor I used is made by Pulse Engineering, part number PE92108KNL. I’d prefer a smaller one, however I couldn’t find one capable of supplying the required current that I could purchase in single units. Besides the PE92108KNL is apparently designed specifically to work with the LM257x series. The circuit also includes a low voltage cut-out based on a 9.1v Zener diode and BC337 transistor that will shut down the regulator if the input voltage is below 11.5V. This prevents unstable operation of the regulator at lower input voltages, and also helps prevent accidental flattening of the supply battery. Substituting this transistor for similar type may affect the cut-out voltage; the Vbe of the transistor should be 1.2v.All of the components used should be pretty readily available in most areas. I got everything from Farnell. Jaycar also sells everything except the inductor. Make sure you specify high temperature, low ESR capacitors as these help result in more stable operation and better efficiency of the charger. Unfortunately the end result is a charger that is slightly bulkier than I would really like. I attempted to fit this inside an old mobile phone charger case so the whole thing could hang out of the cigarette lighter, however I ran into trouble making the circuit stable enough and dissipating all the heat. Due to the high current involved compared to a mobile phone charger the components are much bulkier so it’s pretty tricky to get all to fit! If I do get it finished I’ll add an update. 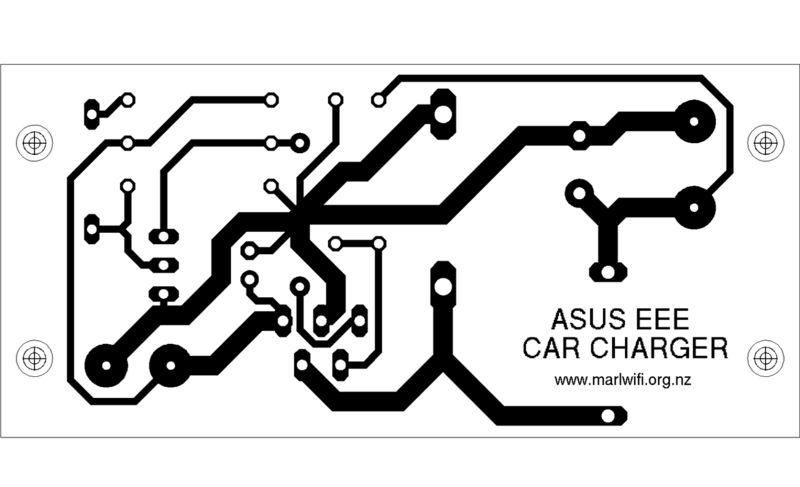 Make yourself a PCB using the template below (600dpi). I simply laser print (or photocopy) the design onto OHP transparency sheet and then transfer the toner onto a blank PCB using a standard clothes iron. Any missing spots can be touched up with a permanent marker before etching. 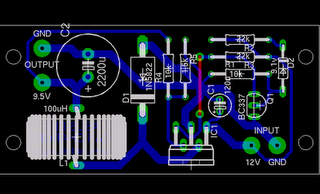 This is quick, usually results in pretty tidy boards and hardly costs a thing. There is a tutorial on a variation of this method at http://max8888.orcon.net.nz/pcbs.htm. 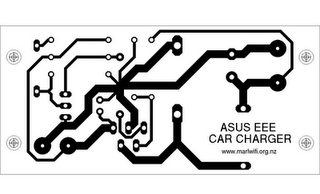 Install the components on the PCB and triple check the layout before soldering. It is much easier to start with the low profile components such as resistors and diodes, then install the larger components after-wards. Don’t forget the wire link; this is shows as a red line on the layout guide above. Remember to smear a small amount of heatsink compound on the regulator tab before mounting the heatsink. For a case I used a small plastic enclosure from DSE, part H2840, as it was all the local store had in stock that was remotely suitable. 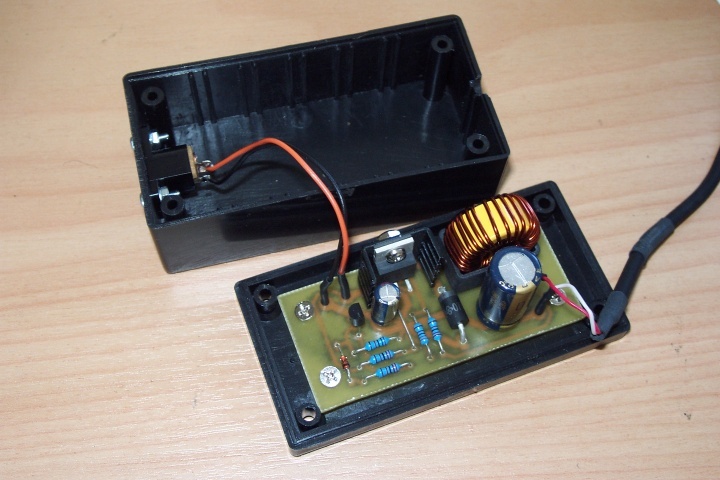 The PCB is designed to fit into this particular case, however any small box should be suitable. If you have a dead laptop charger lying about it might be worth ripping the guts out of that and salvaging the case. If your enclosure is different you may need to modify the design to suit, so I have provided the schematic and PCB design files for download. They were created using Eagle. The Eee uses a standard 1.7mm DC power connector with a positive tip. Connect the circuit to a 12v supply. If you use a car or lead acid battery ensure you have a 3A fuse fitted in line with the circuit before connecting it, just in case. Use your multimeter to check that the circuit outputs about 9.45v with no load. Connect a 12V, 21W lamp (e.g. old brake lamp from a car) or similar load across the output and check that the voltage doesn’t vary much. You should now be able to connect your Eee. The circuit design should be good for up to 2.5A, so there is plenty of margin for the Eee to fully function and charge its own battery off this supply. 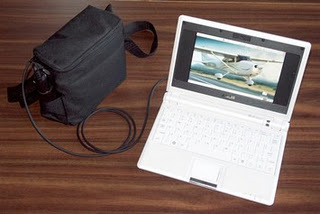 Jaycar have a really cool carry bag with a shoulder strap designed to perfectly fit a 12v 7AH sealed lead acid battery. 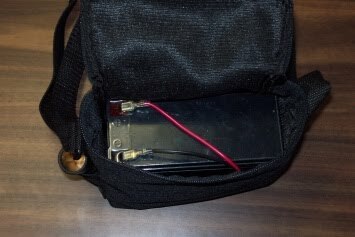 The bag features a fused cigarette lighter socket and is the perfect compliment to this charger. It works well with the Eee and provides hours of extra use. 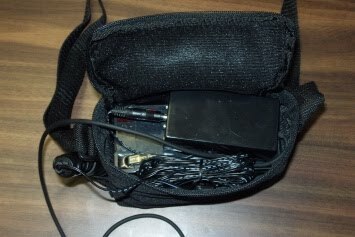 The shoulder strap means it’s not too bothersome to carry about and the charger circuit itself zips up neatly inside the bag. The under-voltage cut-off means the battery will never run completely flat, and the Eee will simply cut over to its internal battery once the SLA runs out. I got my SLA battery from Rexel as they are much cheaper (approx NZ$18 including GST last time I bought one) and they don’t sit as long on the shelf as many other suppliers. 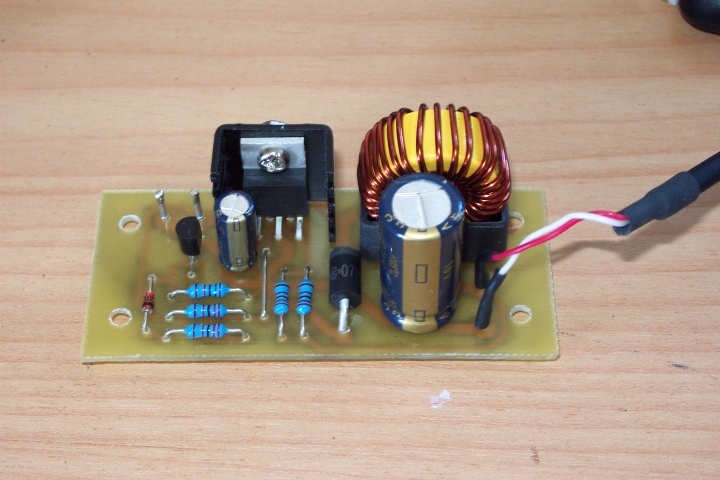 This circuit is intended for people who have had experience in constructing electronic projects before. The circuit design and build process are provided simply as a reference for other people to use and I take no responsibility for how they are used. If you proceed with building and/or using this design you do so entirely at your own risk. You are free to use the content on this page as you wish, however I do ask that you include a link or reference back to this page if you distribute or publish any of the content to others. Source: Marlborough Wi-Fi Contents sponsored by Elektor for 3 months only. Sign up for Elektor Weekly now.